Alyssa Bullock shoots a three, not realizing she surpassed 1,000 points after splashing through the next. Chamois’ senior guard Alyssa Bullock had no idea going into Thursday night’s State Quarter Finals that she was four points shy of toping 1,000 career points or would end up having 1,000 memories of her 18th birthday. Bullock needed one point after hitting a three in the first half, sitting on 999 career points. Chamois had worked over a minute off the clock, giving them the final possession in the third quarter. 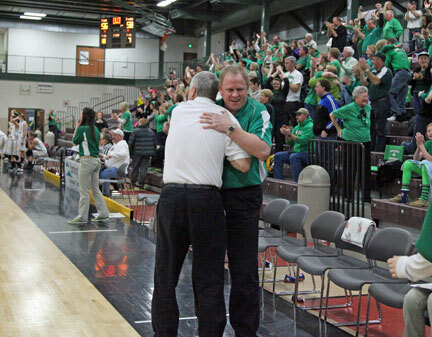 An elated Coach Doug Pierick and Tim Scheer following an amazing game. Farmington, Mo. - New Haven advances to the final four in dramatic fashion, knocking off Neelyville 58-56 in overtime. The Lady Pirates are headed where no Chamois team has ever been, Missouri Class 1 State Final four after defeating Norborne 45-24 just moments ago. They will play on Thursday, March 7 at 8:20 p.m. and I can guarantee the town of Chamois will be closed. Last one to leave turn off the lights. Miranda Brandt fly's in for an easy layup. Sturgeon, Mo. 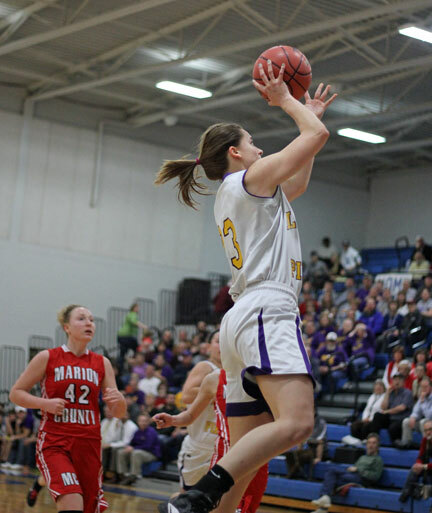 – The Lady Pirates are headed into the Class 1 State Quarterfinals after a convincing 59-33 win over Marion County in Thursday night’s state sectionals. Miranda Brandt was on a mission and nothing was going to stand in her way, posting a double double, pouring in 32 points on 14 of 19 shooting and pulling down 12 rebounds. 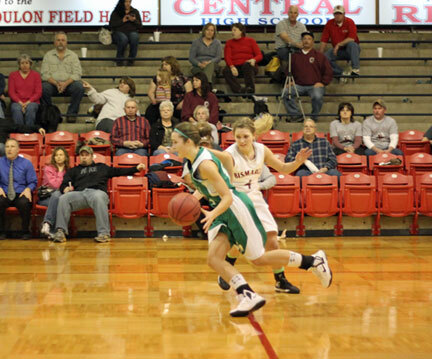 Her counter part, Alison Mehmert added 16 points, dished out four assist, and finished with six rebounds. Kierstin Monzyk kick started New Haven's 20-3 run to end the first quarter. Park Hills, Mo. 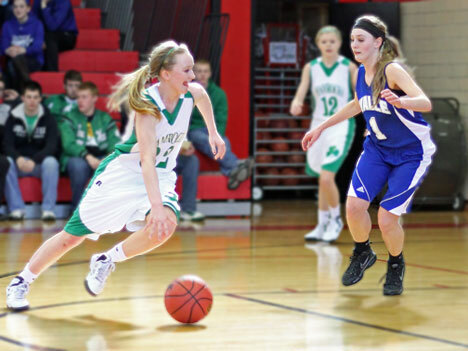 – Kierstin Monzyk ignited the bomb New Haven dropped on Bismarck, scoring a season high in points scored in a quarter, taking a 22-4 lead in the first period of Wednesday night’s Class 2 State Sectionals. Monzyk, New Haven’s lone senior, had no plans of ending her career at Park Hills High School as she raddled off nine of her 12 points in the first quarter. Rachel Steinhoff led all scores with 16 points while dishing out five assists. Coach Doug Peirick attends to Emily Kallmeyer after suffering a severe sprain late in the second quarter of Saturday's District Championship. New Haven, Mo. - We spoke with Coach Doug Peirick Wednesday morning on the status of Emily Kallmeyer who suffered a severe sprain to her right ankle in Saturday’s District Championship game. Questions have circled on whether she will be able to play in tonight’s girls Class 2 State Sectionals. 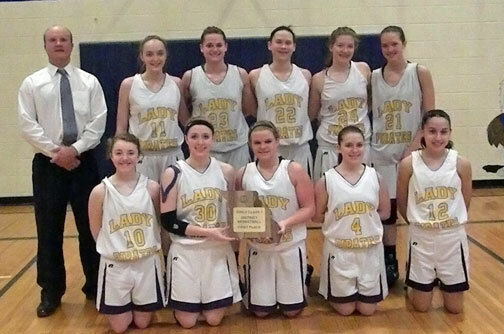 Lady Pirates win second straight Class 1 District Championship. Jamestown, Mo. - The Chamois Lady Pirates will advance into the Class State Sectionals after bringing home a district title for the second straight year after knocking off Glasgow 47-37 in Saturday’s district championship. Miranda Brandt scored a game high16 points, grabbing 16 rebounds, and held Glasgow’s leading scorer to a season low four points. Paige Nolte and Alyssa Bullock each added 10 points. Crystal City, Mo. – Rachel Steinhoff was a machine with a mission and nothing was stopping her from scoring a career high 24 points, leading New Haven to their second straight District Championship by knocking off Valle Catholic 37-25. The Lady Rocks pick up their fifth straight win, improving to 18-10 and advancing into the Class 2 state sectionals at Park Hills on Wednesday where they will face Bismarck. 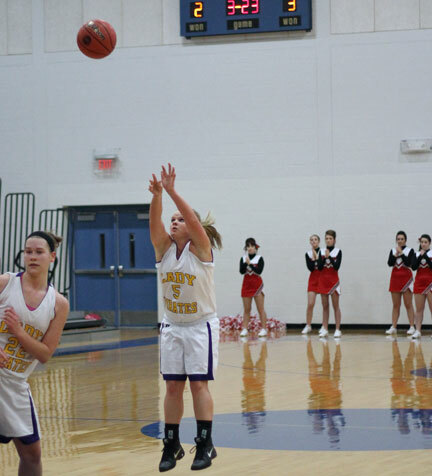 Girl got madd skills...Emily Kallmeyer nice little left hand floater for two of her 10 points against Barat Academy. Crystal City, Mo. 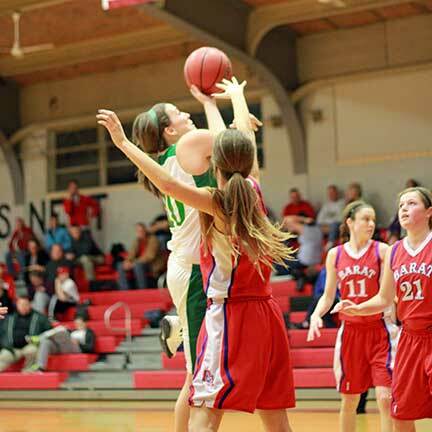 – Monday night New Haven pounded Kingston 64-15 and after Wednesday night’s 50-25 win over Barat Academy the Lady Shamrocks will have a chance to win their second straight district title Friday night. The game will be broadcasted on QuickNewsNow.com. Game time is set for 1 p.m. Saturday afternoon. There is not a lot to write about either game except New Haven’s offensive team onslaught, it’s not been just one or two players scoring, it’s been six and seven girls each contributing four to eight points. Emily Kallmeyer who dished Rachel Steinhoff the pass, leading to her 1,000th point, dishes Rachel a ball with 1,000 on it. Prior to the start of Thursday night's game, Emily Kallmeyer presented Rachel Steinhoff with a green and white ball with the number 1,000 painted in gold lettering. 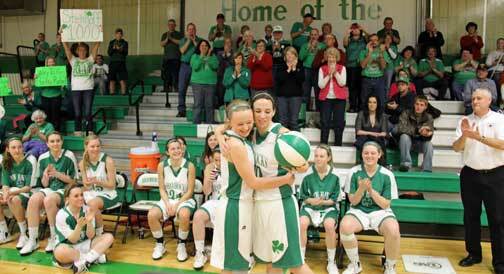 Monday February 11, 2013 at 8:46 p.m. Rachel Steinhoff joined an elite group of players to score over 1,000 career points. Steinhoff becames the fifth player in history of The New Haven Girl’s Basketball program and just the second player to top 1,000 points before their senior year.